The Oktiabrskaya Hotel is one of the oldest St. Petersburg hotels located at the central part of the city where two main avenues Nevsky and Ligovsky meet just in front of Moskovsky Railway Station. The hotel is 100 metres away from Ploschad Vosstaniya metro station. Within walking distance are: Alexander Nevsky Lavra, Anichkov Bridge, Oktyabrsky Concert Hall, Passage and Gostiny Dvor department stores and many other places of interest. The hotel building was constructed in the middle of the 19th century. Distinctive interior of all rooms makes the hotel unique. 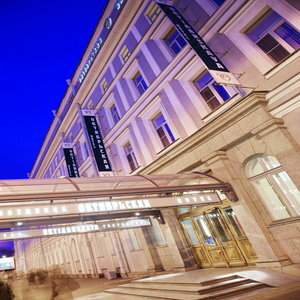 The Oktiabrskaya Hotel is able to accommodate up to 1,000 guests in the rooms of its 2 blocks: "Oktiabrsky" and "Nevsky" and over 200 guests at the affiliated branch "Ligovsky". There are 551 rooms and suites in the hotel excluding affiliated branch (14 triple rooms, 200 twin/double rooms, 240 single rooms, 87 junior suites, 6 suites and 4 apartments). All the rooms have a bathroom, long-distance telephones, satellite TV, refrigerators. Some of the hotel rooms give a view of the city prospect. Peaceful and quiet, the comfortable furniture, the cosy halls are conducive to good rest. The affiliated branch "Ligovsky" is located just across its main building. All 111 rooms were recently renovated in 2001 to meet the international standards of quality. Restaurant and bar are open at the main lobby of the Oktiabrskaya Hotel. There are 3 Halls at the restaurant for 200 guests. The hotel restaurant offers "buffet" for breakfast and "A La'carte" for other meals. There is gym for the guests of the Oktyabrskaya Hotel. The beauty parlour of the hotel offers massage, manicure, solarium, cosmetologic procedures. Also at the guests' service: a billiards room and cafe, shops and souvenir boutiques, currency exchange point, air and railway tickets, first aid point, post office, luggage room, parking, laundry and dry-cleaning services. There is a professional fully equipped security service in the hotel.